Southern Utah Fall Colors produce intense shades of reds, oranges, and yellows are the perfect compliment to the desert scenery. Unlike other areas, the fall season here is very long – nearly 2 months in total! The leaves begin to change first in the highest elevations and eventually the color makes it’s way down to the lowest elevations deep in the canyons. But as you well know, timing is everything and you don’t want to arrive too late or too early. The purpose of this article is two-fold: First, we hope to inform you of the average time for best color in various locations. This will help you plan your travels better. Second, by providing this information in a sequential flow, if the color is earlier or later than normal, you’ll know what the best backup location(s) will be. The leaves in the highest elevations start changing in mid September and usually peak about a week before October. If you head out towards the North Rim of the Grand Canyon, you’ll find groups of aspen trees lining the meadows. 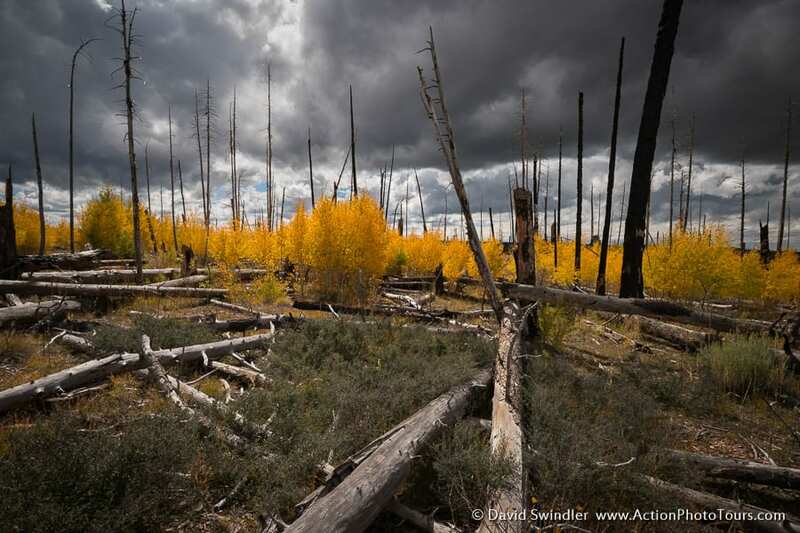 Venture off the pavement and you’ll find plenty of fall color mixed in with ponderosa pines. The burn areas along the highway are especially beautiful as the new growth shows off it’s fall wardrobe. 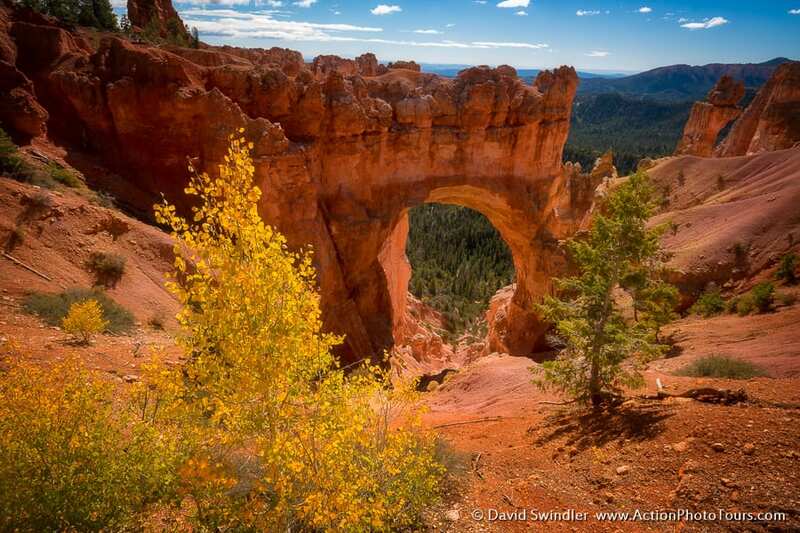 The aspens around Bryce Canyon also begin to change during this time. The color don’t last long and if there’s any wind, they might get blown off. Towards the end of the month, autumn leaves are in full force in the highlands above Cedar Breaks National Monument. There are huge groves of aspens all throughout these mountains and compositions will range from large landscapes to intimate macro shots! 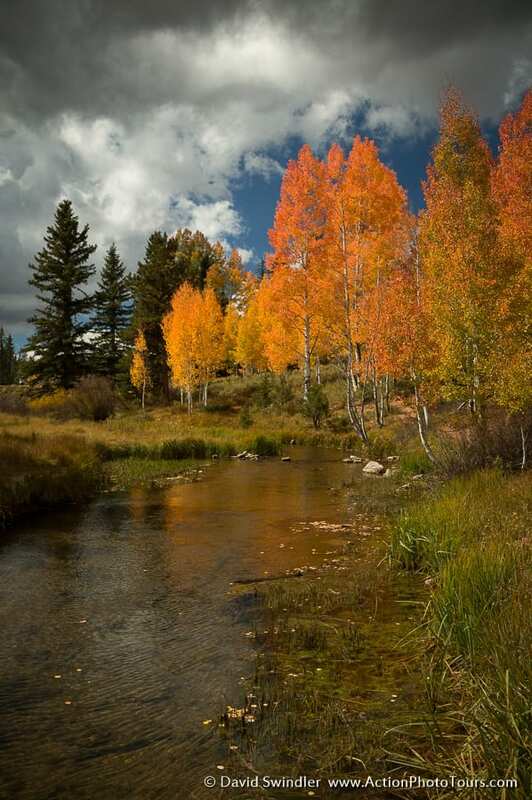 You can visit Cedar City’s website where they give up-to-date fall color status updates. Early October is peak season for areas like Duck Creek Village. 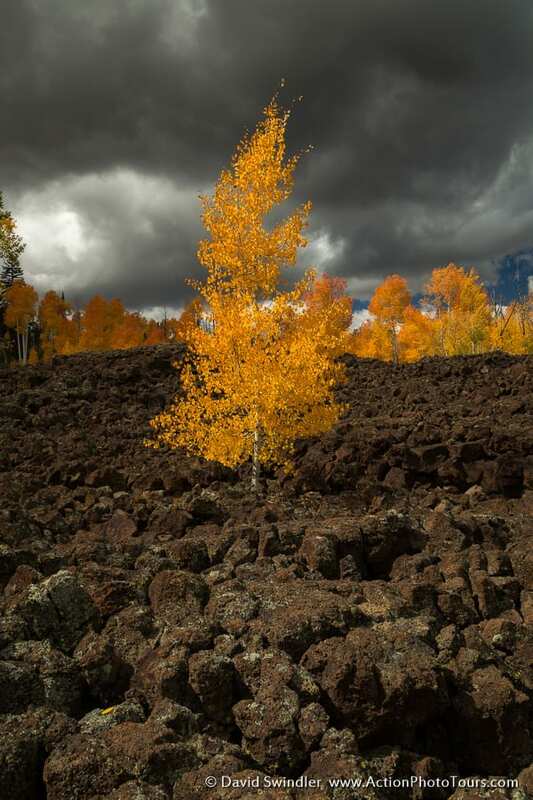 One of the my favorite compositions is to catch the aspen trees growing in the lava rocks. The area around Mirror Lake just explodes with color and beautiful compositions abound with the streams, swamps, and lakes. This is also the best time to visit the Henry Mountains north of Escalante and many great compositions can be made right from the highway. Mirror Lake Fall Colors – Oct 2nd. 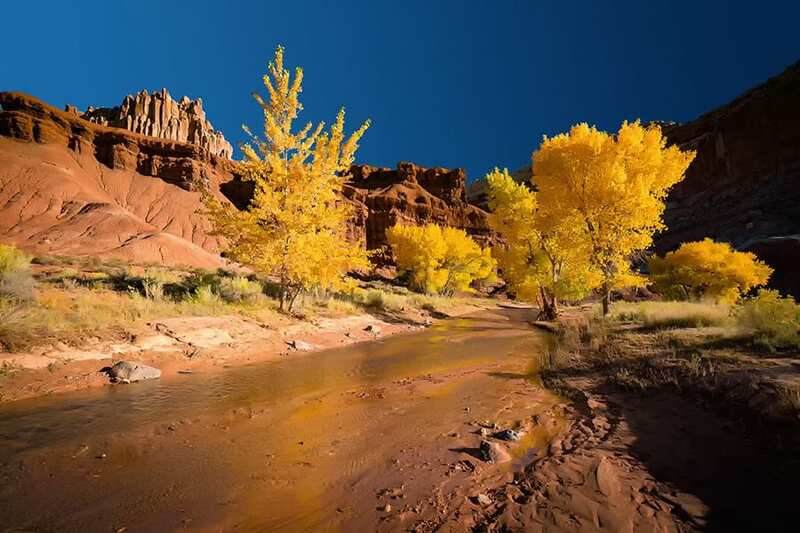 Mid-October brings peak fall color to areas such as Capitol Reef National Park, the highlands of Escalante, and East Zion. Capture the brilliant yellow cottonwoods along the Fremont River. Drive the Burr Trail for many impressive viewpoints. 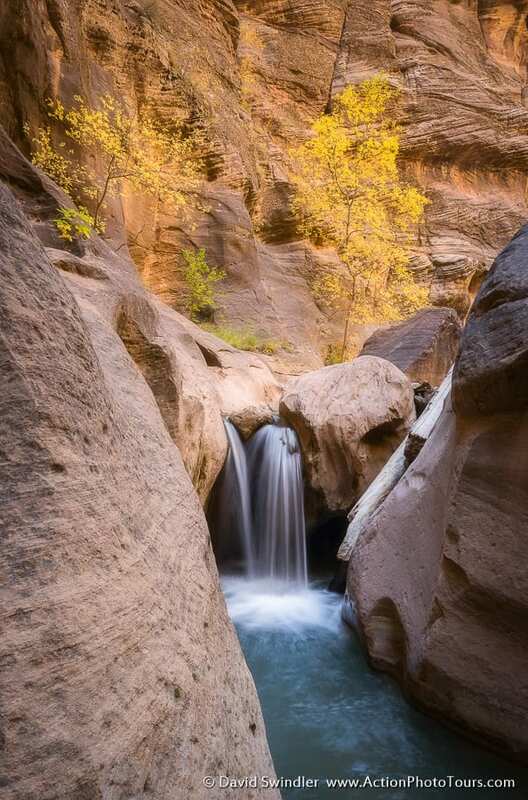 Hike out to Calf Creek Falls and see a dazzling array of colors. Drive through East Zion and explore the Pine Creek drainage. Get a permit and hike the Narrows top-down for an explosion of red and orange maples. The options are endless. Due to client demand, we have added a mid-October Fall Color Workshop for 2018 and we just have a couple spots left. We have permits to guide in all these areas and beyond. 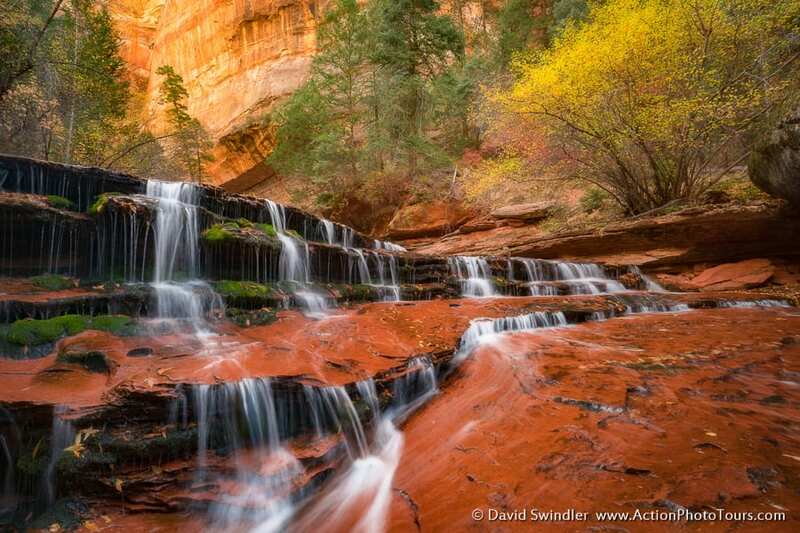 Contact Us in advance of your travel dates and we’ll setup the perfect Southern Utah Fall Colors photo tour for you. 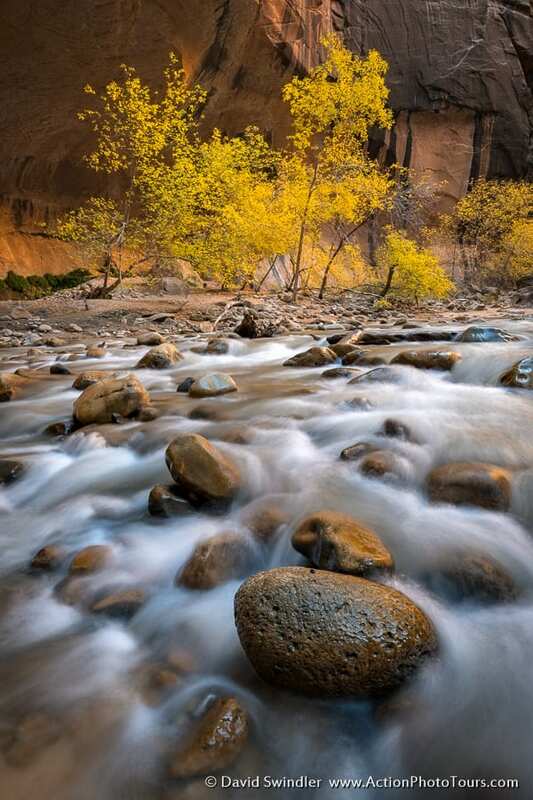 Upper Zion Narrows – Oct 15th. 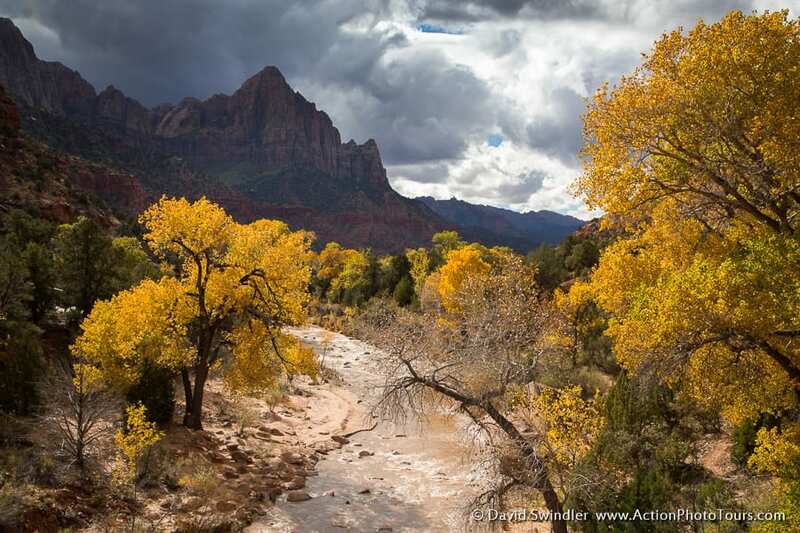 East Zion Fall Colors – Oct 18th. 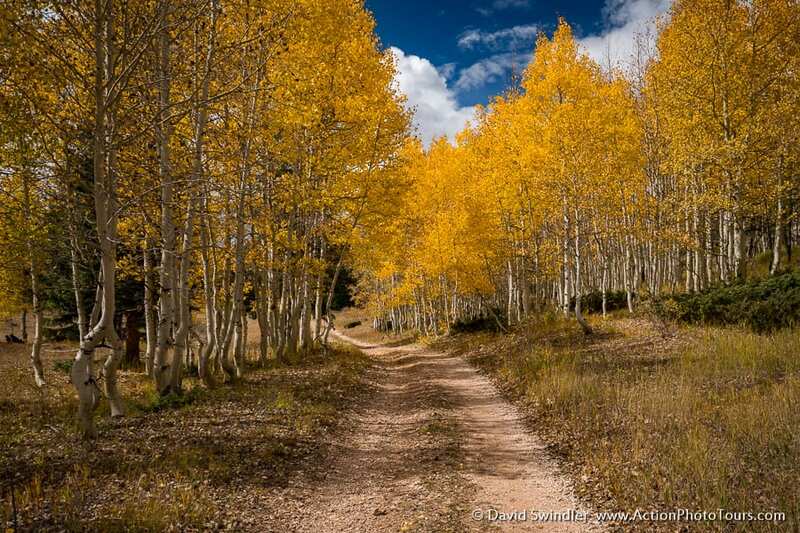 Capitol Reef Fall Colors – Oct 21st. 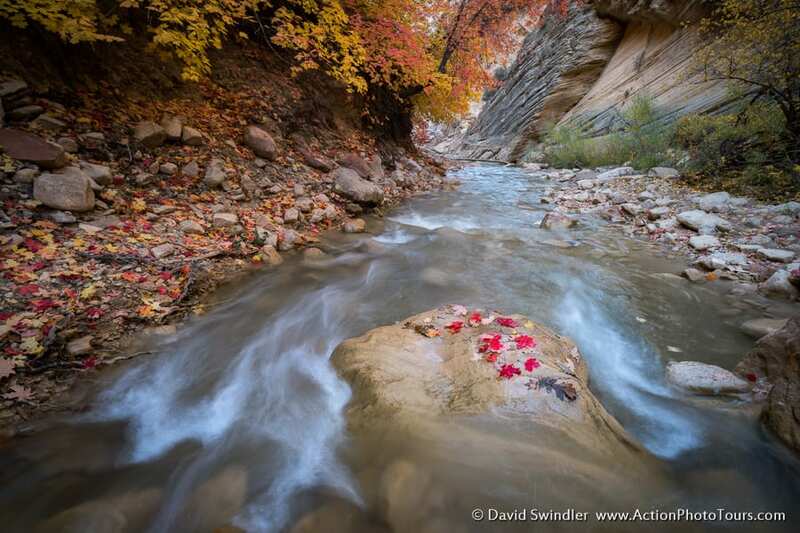 Late October brings autumn displays into the lower canyons. 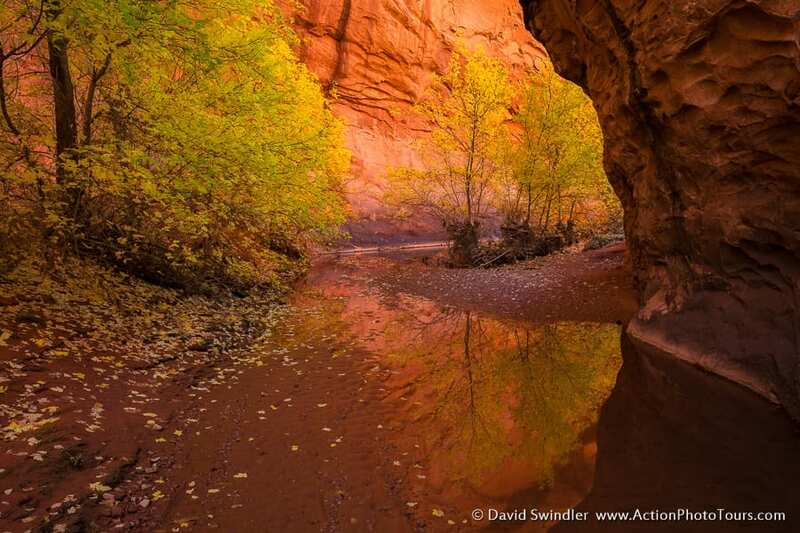 This is a great time to venture into the Subway or Orderville Canyons in Zion NP. Colors in the Subway will run from late Oct into the first week of November. 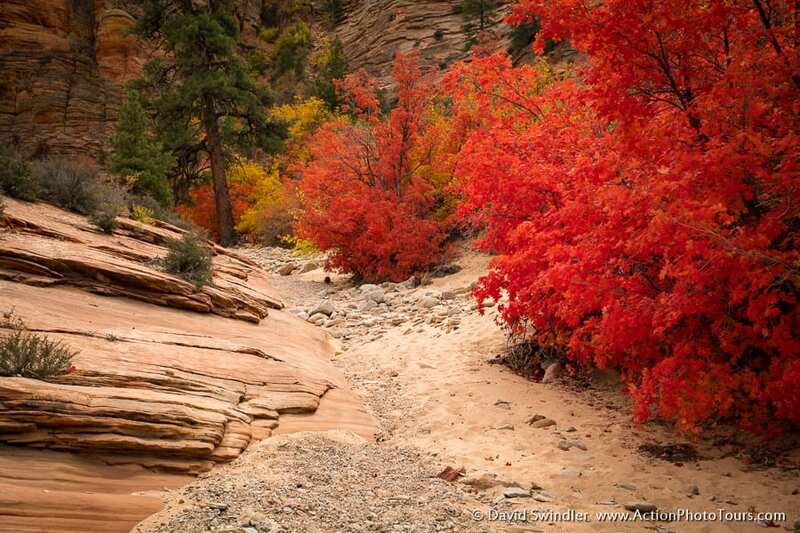 Zion Canyons Fall Color – Oct 24th. Early November brings the best fall colors to the lower canyons of the Escalante, the Subway, the Narrows, and Zion Canyon. This is a great time to visit and you’ll find them much less crowded than during the summer months! For wet hikes, make sure you bring warm neoprene socks or waders since the water is quite chilly this time of year. Peak color sometimes comes during the first week of November. But in other years, it may not come until the 2nd week. It’s best to plan a bit of flexibility into your schedule if possible. If the colors haven’t changed yet in the lowest part of the Narrows, just keep on hiking up canyon and you are likely to run into nice colors at some point in the canyon. The colors at the bottom of Zion Canyon can sometimes take until mid-Nov to peak. 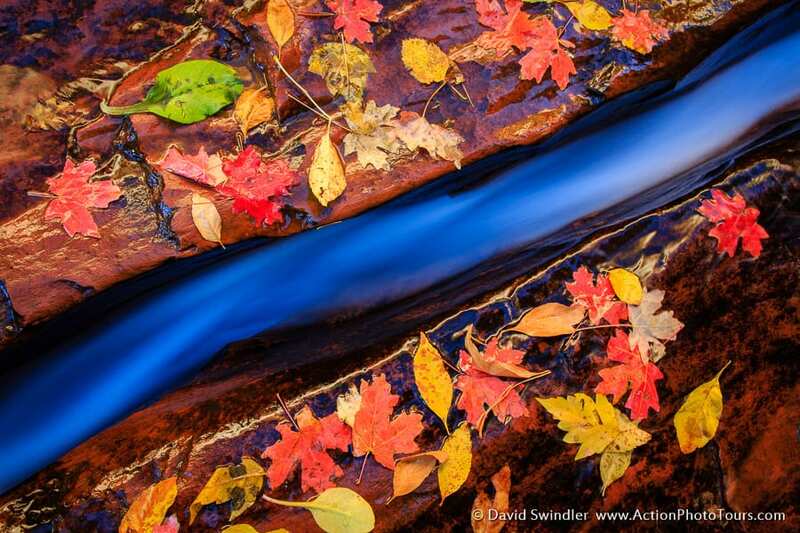 Take hikes up into the Emerald Pools and Hidden Canyon for more displays of color. In certain years, the entire edge of the river near Big Bend will turn dazzling shades of red and orange. If you’re looking to expand your photo skills and visit the best places at peak times, just Contact Us and we’ll setup the perfect photo tour for you. Single day and multi-day options are available! You need to come and experience Southern Utah Fall Colors yourself. Canyons of the Escalante – Nov 7th. Fall Color in the Subway – Nov 7th. Fall Colors in the Narrows – Nov 11th. Zion National Park – Nov 10th.